Mercy Alive! Does anyone else think Jen Hatmaker is a flat out rockstar?! Geez, Loise. Wow! As I sit here and look upon my five piles of laundry larger than Mt. Everest (only a slight exaggeration. I think Justin, Perry, RUBY! !, and I have more clothes than any other family on the planet. Ok, maybe we don’t have Beyonce beat, but I’m totally convinced the tally’s pretty darn close!) How did we get so much CRAP in our house?! Yep- I SO get that. But, the kicker is, we continue to bring in MORE. As humans, we like nice things. I swear to you, if you were to put 6 different trash bags in front of me, without knowing the price or name brand, I would without-a-doubt, pick the celebrity $15 per bag pack of garbage bags. That’s just how I roll. Just ask my poor husband. But the thing is, Jesus commanded us to love thy neighbor as our self. And frankly, I/we as Americans are doing the crappiest job of that. Our ‘neighbors’ do not have the things they need to live life and we are drooling over a new bass boat. And by me, I mean my sweet husband. I’m drooling over a new camera lens. How sad is it that we are all but guaranteed everything we WANT in America? But more so than that, we convince ourselves that we NEED the $100 pair of Jessica Simpson shoes or the $200 pair of Costa SUNGLASSES that are going to be sat on anyway if I’m the owner. I’m SO throwing 2 people in my immediate family under the bus here. My downfall? Vera Bradley bags. BAGS! Without a doubt, I have no less than 8 and that my friends is stupid, ridiculous, sad, and selfish. Selfish. That’s how I’m feeling today. I’m now putting my couch up for sale. 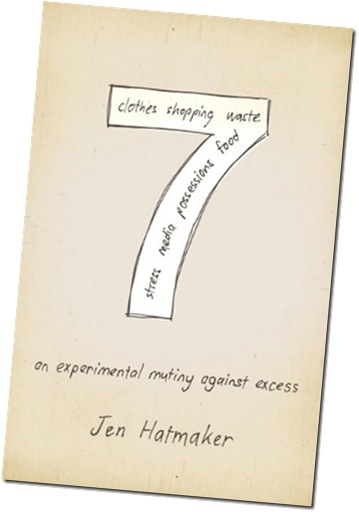 PS- Jen Hatmaker- 7: An Experimental Mutiny Against Excess. If you haven’t read it, I HIGHLY recommend it. It will TOTALLY rock your world! I'm going to be completely honest - part of me really wants to read this (love the Bible Study I did by Jen Hatmaker) but at the same time I'm a bit reluctant to read it b/c I'm not sure I want to be convicted that much! Ugh! That's so horrible. Just keeping it real. ;) Hugs!